More than 60,000 software developers now work in the Seattle area, and four out of five of them are men. Here's a look at the gender breakdown of our metro area's top 25 jobs. There’s a new top job in town. Software developer is now the most common occupation in the Seattle area. According to data from the Bureau of Labor Statistics, there are more than 60,000 employed in that field here. Retail salesperson, the former No. 1 job in Seattle (and still the most common job in the U.S.), fell by the wayside in 2016. Another remarkable thing about software developers in Seattle: Four out of five of them are men. That statistic may be striking, but it probably doesn’t come as much of a surprise. 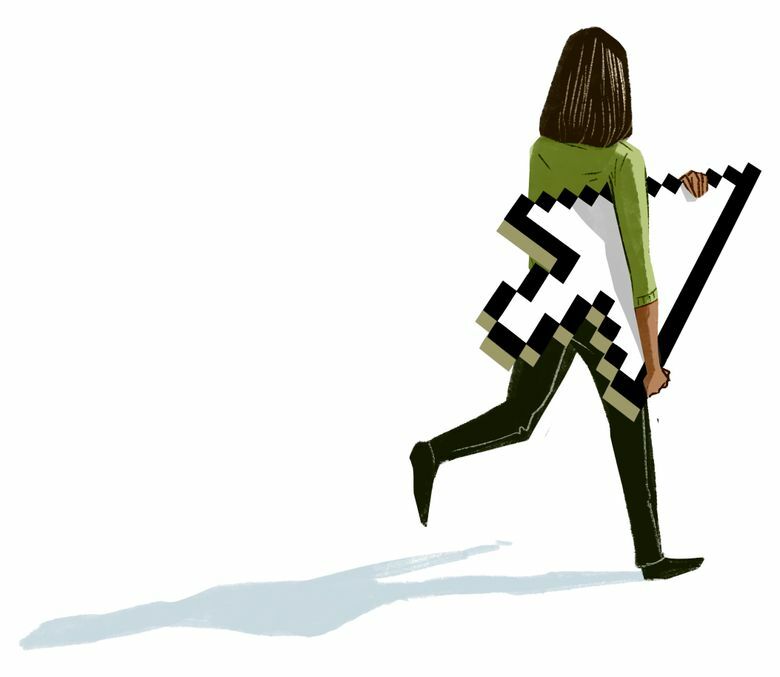 The gender gap in tech, and the reasons behind it, are well publicized and even controversial. Researchers have studied it, and the media has scrutinized it. But the gap is hardly unique to tech. I looked at the gender breakdown of our metro area’s top 25 jobs. What’s remarkable is how few of these occupations come close to parity between the sexes. In 21 of these 25 jobs, either men or women make up more than 60 percent of those employed. 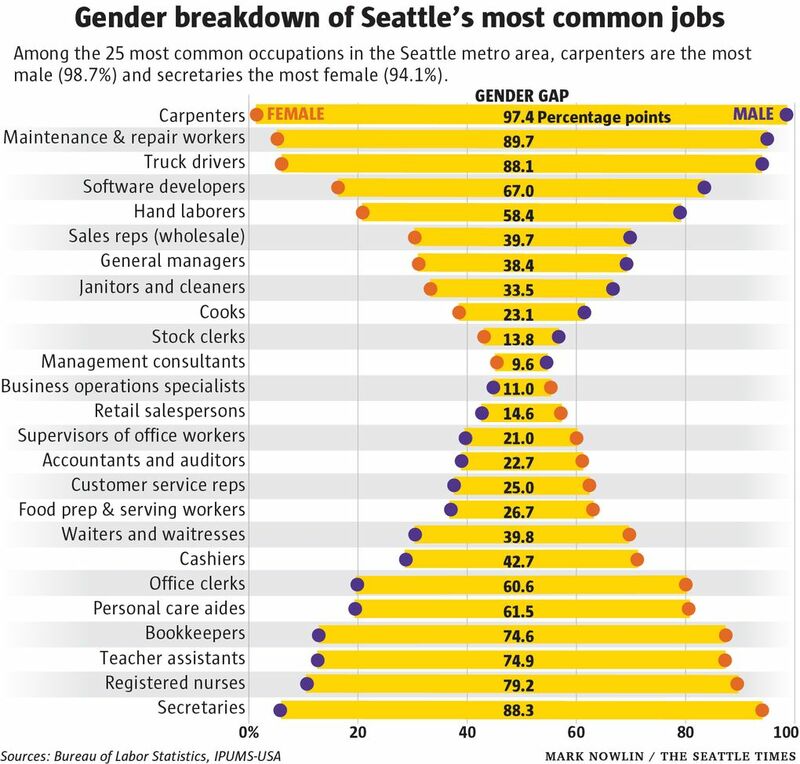 A female carpenter in Seattle is something of a unicorn. The occupation is the most heavily skewed of any in this area, at nearly 99 percent male. General maintenance and repair workers come next, at about 95 percent male. In the third most-skewed occupation in Seattle — secretary and administrative assistant — the scales are tipped the other way. The occupation is 94 percent female. The job that comes closest to gender parity is management consultant. 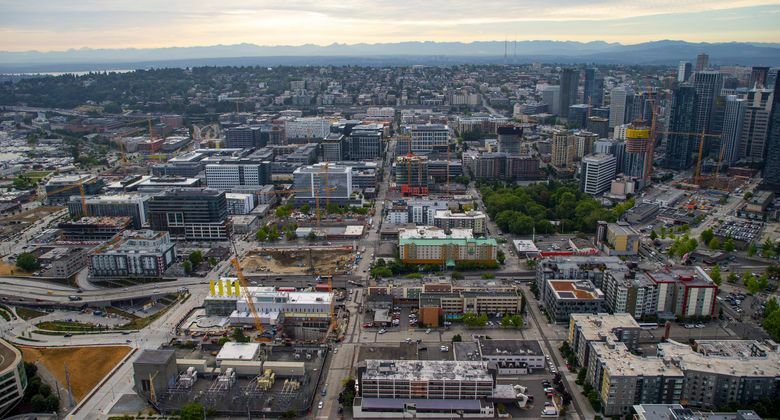 This occupation is not among the top 25 in many places, but it is in the Seattle metro — we have 16,000 of them — and about 55 percent are male. If you’re not familiar with this occupation, management consultants are hired by companies to help them improve efficiency and streamline operations. In other words, when these folks start showing up around the office, it’s probably a good time to get your résumé up to date. Management consultant is also one of the best-paid occupations among the 25, with a median pay of about $104,000 in Seattle. Women are overrepresented in many of the lowest-paying jobs — restaurant wait staff, cashiers, personal-care aides, food preparation and serving workers, and office clerks. A smaller number of the lower-paying jobs are male dominated, including hand laborers (these are mostly warehouse workers), janitors and cooks. All of these occupations have median wages of $35,000 or lower. The two highest-paying jobs on the list are software developers and general and operations managers, both of which employ a lot more men than women. The most lucrative job dominated by women is registered nurses, who have a median wage of about $81,000. The underrepresentation of women in tech has received so much more attention than gender gaps in other fields because of the ever-increasing importance of that industry. Tech dominates the list of the world’s most valuable companies. So far, little headway has been made in closing tech’s gender gap. But history proves such disparities are not set in stone. I looked at data on Washington occupations from 1950 and compared it to the most recent numbers, and I found some examples of dramatic shifts in the gender balance over the decades. Here’s a selection of jobs that were male dominated in 1950, but are majority female today: Chemists, opticians, bartenders, photographers, bakers, veterinarians, real-estate agents, fitness and recreational workers, travel agents, college teachers, dispatchers and social workers.